Free Luas Cycle Racks are racks that you can lock your bike too located beside or close to more than two thirds of Luas stops. Luas currently has 320 free Luas Cycle Racks, each accommodating 2 bikes, spread across both Luas lines. That is 270 bike parking spaces on the Luas Red Line and 370 on the Luas Green Line. 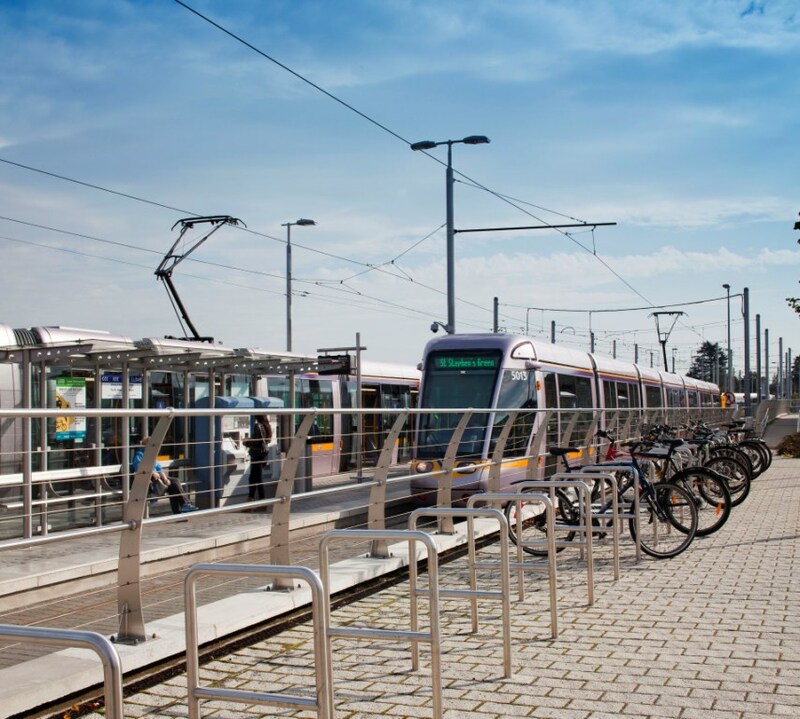 Throughout 2011 and 2012 the Railway Procurement Agency, funded by the National Transport Authority, are improving Luas Cycle + Ride facilities. We are in the process of planning and installing 47 additional bike racks (that's 94 new spaces) at stops on the Luas Red and Green Lines. The first Luas dedicated Cycle + Ride facility has opened at Dundrum Stop. This facility has bike parking spaces for 52 bikes. Spaces are a combination of 10 bike lockers (1 bike each) on a trial basis and 21 bike racks. This facility has a weather shelter and is open 24/7. For more information about the Bike Lockers click here. If this facility is popular with customers we will look at rolling out similar facilities where we have space across the Luas lines. Improvements in on and off street cycle lanes is mostly outside Luas control; it is the responsibility of the various local authorities. However we work closely with them on any improvements of cycling access to Luas stops and we are in talks with the local authorities about improved cycling access to Luas stops. Are the bike racks are always full at your stop? Are people parking their bikes on railings at your stop? Does you stop not have bike racks and people are parking their bikes close-by. Is the lighting at the Luas bike rack you use is too dim? Email us a picture and some info at info@luas.ie. We'll investigate your suggestion and let you know how we get on.